Em's Knitty Corner: Why computers sometimes frustrate me! Ok, after 10 minutes of waiting I'm finally able to start writing this post. It hasn't been the only problem I've been having the last 2 days. I love listening to quite a few podcasts, and I subscribe to all of them through iTunes. That makes it so much easier. Now yesterday iTunes simply refused to download a few of my podcasts and it's still refusing today, without giving me an accurate reason. Damn!!! 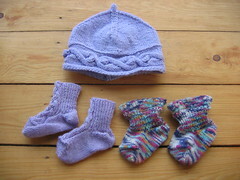 2 pairs of socks and a hat, both from IK (different issues though). I loved knitting the socks! 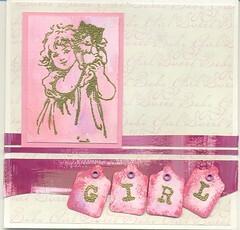 I made this card today to go with it all. I packed it and handed it over today. Of course I had to mess up again. I always do, I make such a fool of myself and I'm always so embarrassed. I hardly feel like facing her again. She had just fed her little girl and was holding her while she was falling asleep, and me of course started speaking way to hard - my voice can be quite load - and I got an immidiate "shhh!!!!!". I felt so upset! I just wanted to turn around and run out. Ok, I know, I shouldn't be so upset but I usually am and I'm just so insecure that I can hardly handle it. It'll haunt me for days now. I'm sorry, I wasn't able to get a better picture. I kinda made up the design, tell me what you think of it, ok? 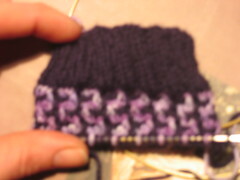 Off now, to work on some other socks, and to try to get my mind of my not so pleasant day. The mosaic is cool and I love the baby hat. Love the babby hat, what issue of IK is it from? I'm planning on making those socks too. I think the Sockapaloooza design is cool too.